At the time of Christ, Saul was born in Tarsus, a coastal city now located in Turkey. He was a Jew, and as he grew older, he diligently studied the scriptures. After the Savior’s death, Saul, with the permission of the Jewish leaders, began to persecute and jail Christians. He believed that they were teaching false doctrine and leading many Jews away from the truth. Saul also received permission from the high priest in Jerusalem to go to the city of Damascus, 130 miles (208 k) away, and arrest anyone teaching about Jesus Christ in the synagogues there. Saul arose and found that he was blind. Those traveling with Saul led him to Damascus and to the home of a man named Judas. For three days Saul remained there, not eating or drinking. He prayed for help in understanding what the Lord wanted him to do. Meanwhile, a Christian named Ananias received a vision that he should find Saul and give him a priesthood blessing to restore his sight. Knowing that Saul had persecuted and jailed many Saints in Jerusalem, Ananias was afraid, but the Lord assured him that Saul had changed. Because Saul prayed to know the Lord’s will and was obedient after being blinded, his sight was restored and he learned and accepted the gospel of Jesus Christ. He was known from then on as Paul, and he dedicated his life to teaching and testifying of the Savior and His gospel. Color the flannel-board figures, then mount them on heavy paper. 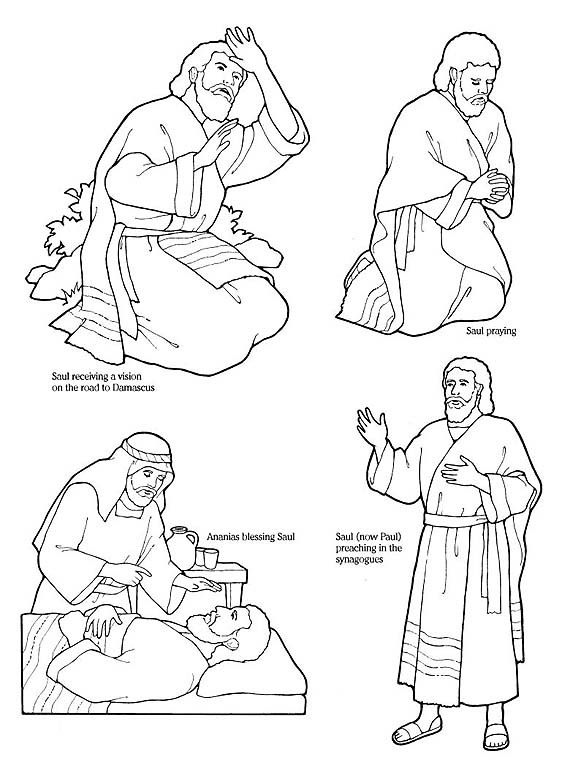 Cut them out and use them to retell the story of Paul’s conversion, and discuss how the gospel blesses your life. Saul receiving a vision on the road to Damascus; Saul praying; Ananias blessing Saul; Saul (now Paul) preaching in the synagogues.